Evidence less cardiology : Is “No-flow” better than “No-reflow” in STEMI ? Cath labs are propably the best place to practice preventive cardiology . . . Practice of medicine is primarily guided by Infinite Information , plenty of Intuition, little bit of Intelligence and unquantifiable amount of Ignorance.The science of coronary reperfusion is standing example for variable mix of the above.The term no reflow is a jargan used liberally in cath labs right from first year fellow to super consultant without knowing what exactly they mean by it. What really is No-reflow then ? With due credits to his seminal paper, I always wonder what exactly Dr Kloner meant when he labelled it as No-reflow! No is ok , Flow is ok , What does the adjective “re” mean to you ? Re stands for repeat ? recurrent ? Yes , it may mean any one of it. It may mean nothing in many patients as their post PCI flow is same or found to be no better than pre PCI flow with no significant forward flow at all ! In this situation No-reflow is same as No-flow (Never flown ) in physiological terms irrespective of epicardial patency. Literally, the term no re-flow tell us, there has been a dramatic procedure related*( or preexisting ) destabilization in distal blood flow. It can be any downgrading of basal TIMI flow. ( Example : TIMI 3 becoming Zero , or TIMI 1 becoming 3 then back to 1 or Zero.) The terms slow flow, low flow, stuttering or trickle of flow all fall under the common category No reflow. In a crude manner one may conclude no reflow to be masquereding term for failed PCI. *Mind you , No reflow can also occur with pharmacological lysis as well. (Less common)But personal experincee suggest it has a less benign course. Many mechanisms has been proposed and disposed by experts. However , all suggested mechanisms end up in the final common theme ie micro vascular obstruction. Can no-reflow precipitate a fresh ACS ? Could be yes . How ? The distal thrombus migration clogs the active collateral channels at its entry point.This is probably the most unrecognised concept which is difficult to prove though.The problem is , we may not realise this as it could be silent or may just present as LV dysfunction , Infarct extension, or Ischemic cardiac failure. Why is treatment of no reflow is so dismal ? I think, by now you can guess the answer and get it right too ! Is no flow better than No-reflow? It may seem a foolish question one could come across in coronary hemodynamics. The prevailing coronary doctrine, as we understand is , all ATOs need to be opened in STEMI in an emergent fashion. (Other wise patients or their myocardium can’t be salvaged )But, we also realise ATO do get converted to CTOs in a safe manner following a STEMI in a significant number. It’s the ultimate myocardial mystery when we realise even the ATO fails to damage the myocardium significantly in some patients. Presence of acute collateralisation to IRA from non IRA is observed instantaneously and spreads rapidly towards myocardium in distress.It is observed in atleast 40% of all patients. (Ref 2,3). The anatomical and physiological codecs of acute collaterals in ACS is secretly located close in the God’s domain.But, Interfering with it, is definitely in human domain. Should we need to worry about the impact of PCI on these acute collaterals ? Is it benefitial, detrimental or neutral ? We don’t know the answer for sure. My understanding is some of subset of critical STEMI are heavily dependent on this life line however miniscule it may be. It doesn’t require a double blinded study to prove what would happen when a hurried cardiologist attempt hurried PCI who often has to a change his target to thrombus instead of myocardium . When aggression is shown on the thrombus, it’s more likely you end up in no reflow . One possible new mechanism(Proposed by the author) of No reflow is distal dissemination of thrombus debri that plugs the lateral entry points of collaterals. This is the time , no reflow shows its violent face. Invariably hemodynamic deteriation occurs and the entire reperfusion team would seem to count their luck than expertise. Can we perceive, predict and prevent this ? We should , we need to , but how ? Since we know the true success rate of no reflow is miniscule, serious introspection to be done. Funnily (but realistically) one can take a famous cue from the most underrated medical specialty Social and preventive medicine . Yes it’s “Prevention is better than cure” and mind you, if there is no cure, how important prevention becomes.Strangley , preventive cardiology is meant for lesser professionals , who and talk about diet, excercise and lifestyle. No , it’s not . Preventive medicine needs a new defintion , rather new understanding .Its’ all about preventing an expected or unexpected adverse event anywhere. How many of us really believe there is no effective cure for No-reflow and it is directly related to aggressive thrombus clearance strategies . Stable and comfortable, late ATOs need not be opened like defusing a time bomb. We will never know which side of the bomb the cardiologist is sitting. As an interventional cardiologist, No-reflow is one among the expected complications , which are part of the profession.Never bother about these unscientific utterrings . That’s the job of critics. You go ahead and fight with the coronary artety in every case of ACS. Only weak minded unprofessionals would love to sit on a case of ACS and play a waiting game in CCU. True professionals shall look for multiple criminal targets beyond thrombus, myocardium, IRA , non IRA, doesn’t matter . Do it with confidence.Hope for the best, don’t bother too much about the endpoint. Mind you, that’s what , we are trained and paid for and possibly respected too in this most glamorous subspecialty of Medicine. *Is Catheter, Guidewire Induced thrombus radically different from natural denovo thrombus ? How to ship a dead heart . . . with an assured life on delivery ? The science of organ transplant has rapidly evolved .We can transfer an organ from one who is dying or dead to another person who is also dying due to failure of a different organ. Though most organs can be transported and transplanted , we need to maintain life in a dead donor organ . A new and curious specialty in medicine is emerging which could be named a Critical Care of Dead or Critical Cadaveric Care Units !) till harvesting happens. Paradoxically ,after the harvest , the organ gains independent life that has to be sustained.This is where the science of organ transport is waiting in to explode! How to transport a dead man’s heart ? There are two Ischemic times in organ donation. Warm ischemic time refers to the amount of time that an organ remains at body temperature after its blood supply has been stopped or reduced. Cold ischemic time refers to the amount of time that an organ is chilled or cold and not receiving a blood supply. These times quiet vary with respect to different organs. Whats new in organ transplant science ? 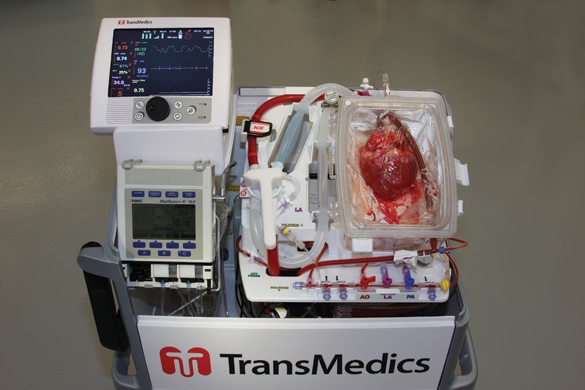 Trans medics is an exclusive company , that has pioneered in this unique science of organ transport .They have developed separate organ care system for heart ,lungs and liver. It is the first portable heart perfusion system , which increase the time between the harvest to transplant . It avoids cold ischemic time ,replaced by warm perfusion with metabolic activity monitored till it is transplanted.Ideal far long distance transplant .Soon one can expect trans-continental transplant as well ! This technology could make the difference between warm and cold Ischemic times blurred and in future one may expect to prolong the warm ischemic period and there is near zero cold Ischemic time. Modern medical technology can be seen in action , in so many ways and brings both accolades and agonies in equal proportion. While, even flimsy ones tend to get due attention , Transmedics , probably deserves a grandest reward for uplifting the science of organ donation . I would think this is the most unique service (playing God ) . . . shipping dead man’s organ with assured life on delivery !